May 10, 2004: 3:00 PM – My sister and I hop on the Metro Red Line from Hollywood en-route to downtown Los Angeles. Incidentally, don’t believe any hype you might hear about Hollywood — there is only about a block-and-a-half of anything worth seeing. The Chinese Theatre and the Wax Museum were interesting, but the remainder of the streets are littered with run-down shops selling mostly racy lingerie, wigs, tattoos, weapons, and body piercing equipment. I expected to see the world-famous Hollywood and Vine restaurant teaming with rich tourists, but was instead greeted by a wayward homeless person supposedly looking for bus fare. But enough about that. We arrived in downtown LA at around 3:15, grabbed a map from the bus terminal, and quickly realized we were only a couple of blocks from the Walt Disney Concert Hall, the venue of the much-anticipated Dear Friends – Music From Final Fantasy concert. I purchased tickets to this event within minutes of them going on sale and have been anxiously awaiting this day. We made our way up the hill towards the concert hall only to find absolutely no indication that any concert was taking place that evening. The box offices were closed, and there were only a scarce few people milling around. We walked in through the gift shop, and I was dismayed to see that there seemed to be no merchandise from the concert available. Upon leaving the gift shop, we wandered around the hall for another 15 minutes or so, but there really wasn’t much to do or see. The majority the building was roped off, and the snack bar didn’t provide much entertainment either. A quick glance at our map indicated that the enormous LA cathedral was a couple blocks away, so we decided to go have a look. It was an amazing sight — I don’t recall ever seeing a church quite that large before. Upon leaving, our watches indicated that the time was roughly 4:00, and I still had upwards of three and a half hours to kill. Torture. Desperately searching for something worthwhile to do, the map indicated that the “Los Angeles Mall” was also just a few blocks away. So, we went over there only to realize that the “mall” was nothing more than a few run-down restaurants and shops (much like what we saw in Hollywood). By this time, we were starting to get a little tired and hungry, so we checked out a local directory only to determine that other than fast-food, there was seemingly no place of interest to eat in downtown Los Angeles. We walked blocks and blocks, past two or three Starbucks, but still couldn’t find a worthy eating establishment. In fact, we couldn’t find much to do in downtown Los Angeles, period. I mean, I don’t exactly live in a tourist hot-spot in Denver, Colorado, but at least we have a nice aquarium, a Six Flags, several sports stadiums, and dozens of nice restaurants downtown to choose from. Needless to say, if you’re looking for a nice place to take your family, LA isn’t it. 5:30 PM – After killing the next hour or so drinking Frapucinos from one of the many local Starbucks stores, I escorted my sister once again to the Metro station. I tried to convince her to take a cab, but she wasn’t impressed with the idea of a $40 cab fare compared to the $0.75 Metro fare. When she was safely on her way, I headed back to the hall and stood in the souvenir line which had just materialized. 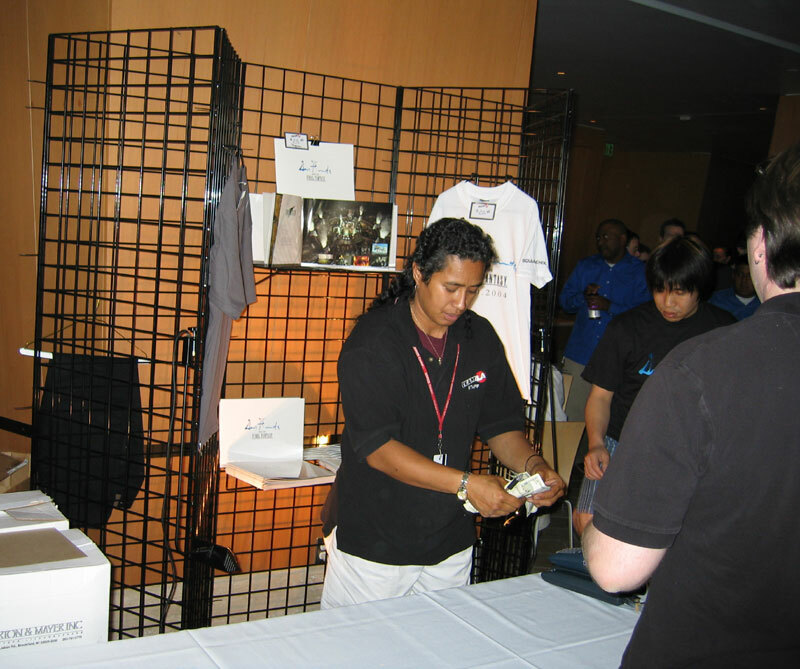 They had T-shirts (grey and white, $20), mini calendars in jewel cases ($15), and programs (*gasp* $25). I reminding myself that this was a once-in-a-lifetime event as I handed over $60 for one of each item. When all my souvenirs were safely stowed in the bag, I headed inside again and waited for them to let people in. Here, I bumped into a guy named Scott from Connecticut. In talking with him, I realized I wasn’t the only one crazy enough to fly in from another state to watch this concert. I chatted with Scott and a few other FF fans for the next half-hour or so until there was some stirring by the security guards blocking the door. 7:00 PM – Finally, something was happening. Several teenage ushers were shouting out orders about where to check bags and cameras. I had my Canon PowerShot S50 digital camera hiding in my pants pocket (thank goodness for small cameras), and I wasn’t about to hand it over to Brutus the bouncer for “safekeeping.” Soon afterwards, my ticket had been ripped, and I made my way to door 3 for seating. A few minutes later, the door swung open, and another gaggle of teenage ushers warned us about photography equipment before letting us in. My seat was in the Orchestra section, row J, seat 152. This put me in the second lowest row in the orchestra, in the center section, first seat on the left. As the starting time neared, more and more performers made their way on stage and tuned their instruments. And then, it happened. The crowd erupted into wild applause and clapping. Everyone stood up, and it finally dawned on me that Nobuo Uematsu himself was making his way to a seat two rows in front of me, but on the opposite side. He was perhaps the most underdressed of anyone in the hall. He wore what appeared to be a grey jogging suit, a pair of white socks, and a pair of those flip-flops you often see at the beach. I just got the sense that he was there to enjoy the music and have a good time just like any other fan. As he approached his seat, he raised his hands high, cheered, and bowed to the crowd. He was flanked by several Japanese stalwarts, but what struck me was how he seemingly didn’t have any “VIP” treatment. He sat down amid fans, and acted as one himself. 7:30 PM – As the din from seeing Uematsu in person finally died down, it was, at long last, time to get started. A tall, black-haired man strutted into the hall through a door to the left of the stage, and the crowd burst into applause once again. This of course was world-renowned conductor Miguel Harth-Bedoya, the man who would be leading the Los Angeles Philharmonic and Master Chorale. He bowed to the crowd, raised his arm, and the orchestra immediately began thundering “Liberi Fatali” from Final Fantasy VIII. It was a surreal experience. As I listened to the choir belting out the chant “Fithos Lusec Wecos Vinosec” and saw Squall battling Seifer on the big screen, I thought to myself ‘Wow, I never thought there would be a video game music concert anywhere much less here in the United States, but there I was attending it’. The piece ended to tumultuous applause and shouting. It struck me that the loud whistles and screams were probably not customary for a symphony, but I think the performers realized that this was no ordinary concert. As the applause died down,a short man bearing an uncanny resemblance to Michael J. Fox ambled onto the stage from the same door that Harth-Bedoya had entered from. I don’t think anyone had any clue who he was, but they applauded anyway. When all was quiet, he muttered the words “This is My Story.” There was a short pause — I think everyone knew where the line was from, but didn’t know how it applied to this concert. He went on to say “My name is James Arnold Taylor, but you probably know me better as the voice of Tidus from Final Fantasy X.” Applause erupted once again. Once you had heard his voice and he told everyone who he was, it was so obvious he was Tidus that I was surprised I didn’t realize right away. 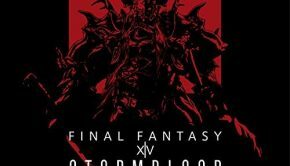 He briefly talked about Final Fantasy music, before he introduced the next three pieces that would be played: “At Zanarkand” (FFX), “Tina” (FFVI), and “Theme of Love” (FFIV). As he said “Tina” everyone cheered again. Taylor walked off, Harth-Bedoya turned, raised his hand again, and “At Zanarkand” began. 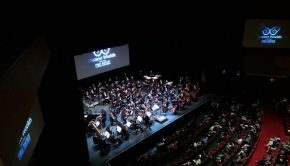 While many of the arrangements in this concert were the same as those performed in the 20020220 – Music from Final Fantasy, “Zanarkand,” among others, was completely new. It was a beautiful mix of the familiar piano introduction, and soft strings. “Tona” was next, and was the same arrangement as 20020220, as was “Theme of Love.” I was a little disappointed that they didn’t at least spice up the arrangements a bit, but it was still beyond cool hearing them all live. At the conclusion of these three pieces, Taylor walked out again and introduced the next three pieces: “Dear Friends” (FFV), “Vamo’ Alla Flamenco” (FFIX), and “Love Grows” (FFVIII). He mentioned the name of the guitar player who’d be strumming the melodies, and though I can’t remember his name, he is apparently quite well-known. The familiar strummed guitar chords rang through, and “Dear Friends” had begun. Again, this was the same arrangement as 20020220, but it was still lovely and emotional. Perhaps my favorite track from 20020220 was next, “Vamo’ Alla Flamenco,” and though the music sounded like the CD, seeing an orchestra play it live was simply unbelievable. Harth-Bedoya flailing around, dozens of violinists sawing away feverishly, trumpet players blowing away, and the subtle low notes of the ‘cello sent shivers up my spine. This was my second favorite piece played during the performance. Rounding out this group of three was “Love Grows,” another 20020220 arrangement. The enchanting melody of Final Fantasy VIII‘s title track “Eyes on Me” was another instant favorite for me — primarily because of the emphasis on piano. Sure, I’d heard it before, but it was quite different (not to mention incredibly cool) watching the pianist glide around the piano with ease on the big screen. A truly beautiful piece of music ad one that makes me want to put more effort into learning the piano. 8:15 PM – The conclusion of “Love Grows” marked the beginning of a 15 minute intermission. Being at the end of the row had it’s advantages. I stood up and watched Uematsu and his entourage march out the doors not more than 10 feet from me. I made a bee-line to follow him, as getting his autograph would’ve truly completed the evening. Unfortunately, he was out the door before I could get near him. I returned to my seat and stood watching and waiting for him to come back. He arrived again about a minute before the performance began again once again to roaring approval from the crowd. 8:30 PM – Harth-Bedoya strolled back on-stage and positioned himself in front of his podium, and shortly after, Taylor appeared again. This time, Taylor began by saying that “Final Fantasy VII has always been everyone’s favorite Final Fantasy game.” Once the roar died down, he continued by joking: “I can’t figure it out. There’s no voices and no Blitzball!” This drew a good laugh from the crowd. He continued by introducing the next three pieces: “Aerith’s Theme” (FFVII), “You’re Not Alone” (FFIX), and “Ronfaure” (FFXI). Though “Aerith’s Theme” was again an identical arrangement, it still drew a great deal of emotion. “You’re Not Alone” came as a surprise to me, as it didn’t seem like the ideal piece for an orchestra. Quite the contrary though, I really enjoyed it, as well as “Ronfaure,” which I hadn’t really listened to and have now grown to love. As the crowd quieted again for Taylor, I could hardly believe what he was saying next (in his best Tidus voice): “It is time for me to say goodbye.” I couldn’t quite believe it, but there were only three more upcoming pieces in the program “Final Fantasy I-III Medley,” an untitled piece from the then-upcoming DVD Final Fantasy VII Advent Children (“Cloud Smiles”), and “Final Fantasy,” the familiar ending theme from most Final Fantasy titles. The FFI-III medley was again identical to the version on 20020220, but apparently most of the crowd hadn’t heard that album. As the Chocobo theme came up, the crowd burst into cheers and screams once again — this time while the performance was going on. This obviously wasn’t proper symphony etiquette, but humorous all the same. Once that piece had ended, you could feel the anticipation as people listened to the piece from Advent Children. Perhaps it was because my mind was upset that the show was almost over, but I don’t remember a whole lot about this piece. It didn’t strike me as memorable, but I’d really have to hear it again to make any fair judgement. The ending theme “Final Fantasy” was next and last on the docket. As I listened to this memorable piece, I couldn’t help but be saddened by the fact that the show was coming to an end. It simply couldn’t be… not this soon! But it was… or so it seemed. As anyone who’s ever been to a symphony would tell you, the conductor bows and leaves the stage after the show, raising his hand to recognize all the performers before leaving and coming back several times. Harth-Bedoya did this amid crazy applause, and walked off and back on the stage twice before grabbing a microphone. He said something along the lines of “It doesn’t look like you guys are going anywhere.” Then, he spoke about how much of an honor it was to be able to conduct this performance. He went on to say that he never thought he’d be conducting a performance of video game music. This drew a laugh from the crowd. He went on to call Uematsu up to the front to say a few words. 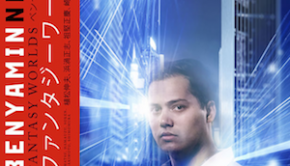 He went on-stage flanked by two other Japanese men. The crowd cheered loudest at this point, and when Uematsu got on stage, he beckoned the crowd to get louder. Everyone obliged, and then he lowered his hands as if to quiet everyone down, which they did, only to have him raise his hands again. Seeing that really made me admire the guy even more. Here he is, the king of the evening, and he’s just out there to have a good time like everyone else. At long last, the crowd quieted as the mic was handed to Uematsu. A lady walked on stage to translate, and Uematsu spoke. He first introduced the other two men that came up with him. It turns out they were none other than Hironobu Sakaguchi, the creator of the Final Fantasy series, and Yoshitaka Amano, iImage illustrator for Square Enix and character designer for Final Fantasy IX. Once everyone realized who they were looking at, the hall was deafening once again. Both men, especially Amano, looked rather surly while Uematsu continued to goad the crowd on. 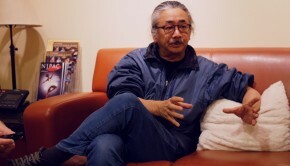 Through the translator, Uematsu voiced his approval of the concert and to fans for their support. He also said that he sees no reason why these concerts can’t become a regular thing and travel all over the globe. The crowd, of course, loved this. The microphone went next to Amano, who commenced speaking in rapid-fire Japanese immediately. He paused a couple of times and the translator opened her mouth, but he continued on each time. After about two minutes of continuous speech, he dropped the microp[hone and looked to the lady to translate. She smiled and looked down exasperated as the crowd chuckled. It must’ve been quite difficult to remember all that was said. The gist of this speech was how much he and Sakaguchi loved the Final Fantasy series so much — almost as ‘their baby’. He went on to discuss what part he and Uematsu played in making the games so special. Sakaguchi spoke next, but he didn’t really have a whole lot to say. He summed things up with two English words that he had seemingly rehearsed: “Great concert!” Judging by the fever pitch of the crowd, everyone agreed. When all was said and done and the three men had returned to their seats, Harth-Bedoya turned to his orchestra once again, and raised his arm once again. The crowd exploded as the first few distinct notes of “One Winged Angel” from Final Fantasy VII rang out. I suppose I shouldn’t have been surprised by this. After all, it was the one omission from the program that really seemed to have everyone baffled. This was again the same arrangement as 20020220, but it just seemed so much more powerful here. With the crowd buzzing, Uematsu beaming, an angry Sephiroth staring JENOVA in the face on the screen, and Harth-Bedoya waving his arms wildly around, any Final Fantasy fan couldn’t help but be inspired by awe. Seemingly before it started however, the theme was over. Harth-Bedoya left and re-entered several more times, but everyone knew this was the end. Once the clapping died down, I stood and kept a close eye on Uematsu and friends, hoping for a chance to approach him. But alas, he exited through the stage door where the orchestra had gone and disappeared from sight. I looked at my watch after the show. It was approximately 9:30 PM and my shuttle wasn’t going to pick me up until 10:30. I walked outside with the idea of ditching the shuttle and just taking a cab, but shockingly enough, there were no cabs around. The more aggressive in the crowd were hailing the few cabs that went by, and I knew it would be a while before I could flag one down. Once it got to be a little after 10:00 and I had been accosted by several transients asking for money, I decided to just wait out my shuttle. After all, the cab ride would’ve probably cost upwards of twice as much. I walked back into the building and noticed a large group of people gathered around someone. I thought for a moment that it might be Uematsu, but instead, it was James Arnold Taylor. I promptly opened my program to the FFX page and stood in line to get his autograph. He seemed almost pleased that so many people wanted his autograph. I didn’t think much of this to be honest — I thought he had basically been some random guy who auditioned and happened to win the part of Tidus in the game. A little research after the show told me that he was actually much more than this. He’s done voices for many other video games, several Disney movies, and is quite well-versed at impersonating celebrity voices. Check out his website for the complete resume and the impressive 60 celebrity voices in 60 seconds audio clip. Anyway, it took a while to get his autograph because he was personalizing each one, which I thought was pretty cool. On each program, he was writing one of his more famous quotes from the game. From what I saw, he wrote “live and let live!” on quite a few people’s programs. 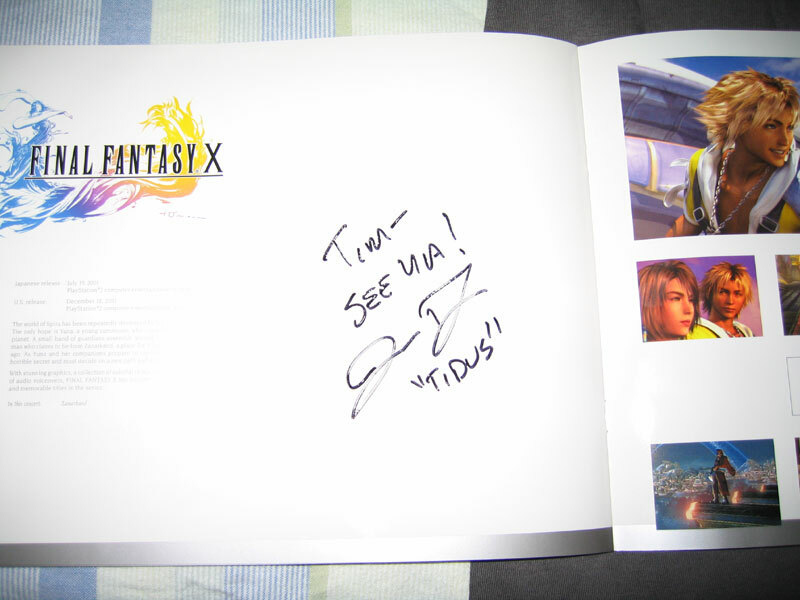 He wrote “See Ya!” on mine, which was the line you perhaps heard the most in the game when Tidus finished off an enemy. 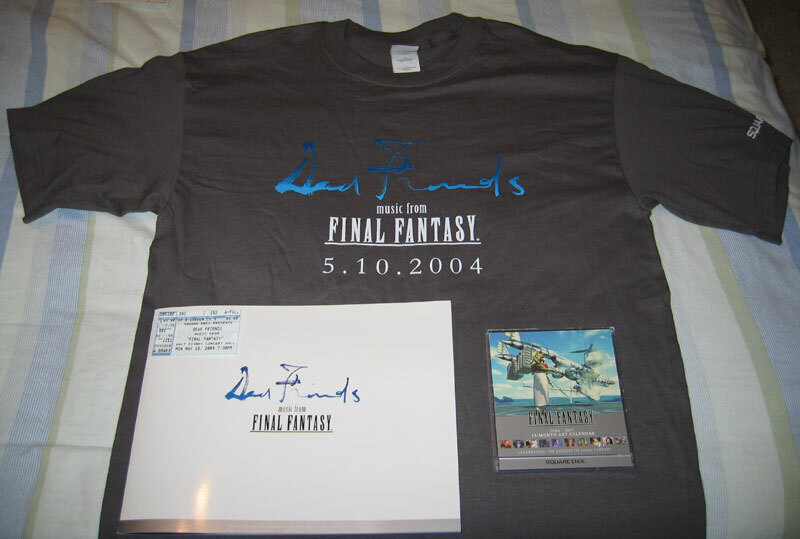 Getting his autograph wasn’t on-par with getting Uematsu’s, but it was a nice conclusion to the evening, and made me glad I hadn’t taken a cab out of there right after the show. All in all, the concert was a very expensive venture for me. I bought a plane ticket, three nights at a hotel, the concert ticket, $60 in souvenirs, numerous transportation fares, three days worth of food, and missed two days of work unpaid. The whole thing probably cost me upwards of $1,000, but to me, it was well worth it. Sure, I could’ve just waited for the CD and heard all the music, but there’s just something about being there that makes it so special. Who knows, maybe these concerts will become commonplace and show in the United States every couple of years. But if not, I can say that I attended the only one, and stood within 10 feet of not only one of the all-time great composers, but the creator of the best video game series ever. Words really can’t describe the experience, but if I had to sum it up in one word, it would definitely be priceless. Posted on May 25, 2004 by Tim Maxwell. Last modified on April 23, 2014.